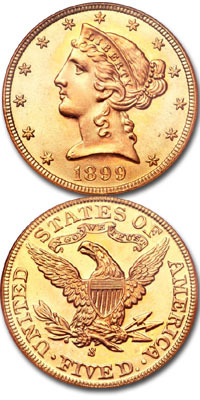 Minted since 1795, only the last two designs of Five Dollar Gold pieces or Half Eagles are commonly seen by the public. These are the Liberty Head Type made from 1839 until 1908 and the Indian Head Type made from 1908 to 1929. The Liberty Head design is similar to that found on other U.S. Liberty Head Coins, that is, it features a bust of Liberty and the date on one side and a representation of an eagle on the reverse. 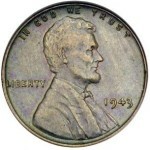 The Indian Head type is unique in U.S. coinage in that most of the design is sunk below the level of the coin’s surface. 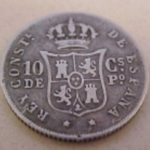 This type of coin is called an incuse design. 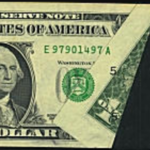 The Indian portrait in profile, is yet another representation of Liberty and the eagle on the reverse sits with closed wings on a bundle of arrows over the words FIVE-DOLLARS. 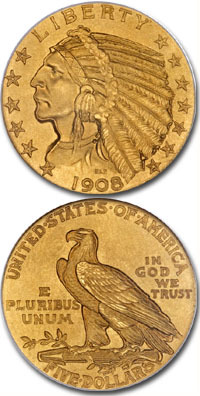 The mint mark can be found on Liberty Head $5 gold coins on the reverse just below the eagle and on the Indian Head $5 gold, the raised mint mark, if any, is in front of the bundle of arrows on which the eagle is perched. 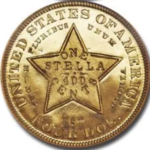 Liberty Head Five Dollar gold coins in average condition are worth about $340-$380. There are many rare dates scattered throughout the series but usually only the most common dates after 1880 are generally seen. 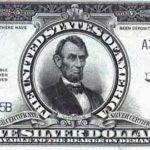 The rarest dates would include the 1875, and just about all the San Francisco Mint pieces from the 1860’s. One outstanding Liberty Head Five of note would be the incredible, almost perfect 1894-S from the famed Louis Elaisberg Collection that brought $18,000 when it first sold at auction in 1982, and just 6 years later, in the summer of 1988, it again sold at auction – this time for the princely sum of $105,000! Indian Head “Fives” in average condition will bring about $350-$400 each. Most of the dates are considered common, but the 1908-S, 1909-O, 1911-D, 1913-S, 1915-S, and 1929 are among the scarcest dates in the series. The 1929 is the rarest date and is worth at least $10,000 in any condition.